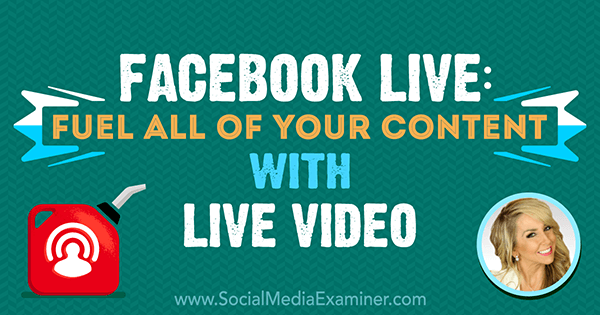 Do you broadcast on Facebook Live? Want to discover how to use your videos to create more content? To explore why Facebook Live is a path to success for creators, I interview Chalene Johnson. In this episode, I interview Chalene Johnson, a lifestyle expert, author of Push, and host of two top podcasts: Build Your Tribe and The Chalene Show. She’s also active on Facebook with 1 million fans and regularly uses Facebook Live. 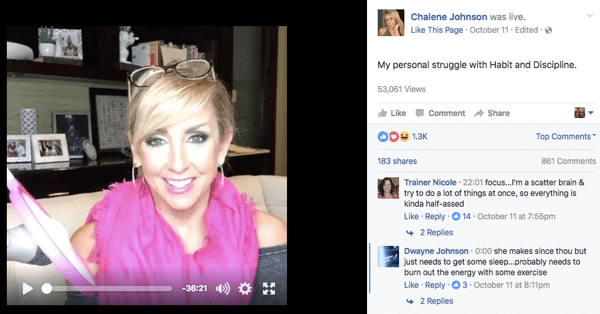 Chalene shares how she uses Facebook Live. You’ll discover what she does to leverage the content she captures. 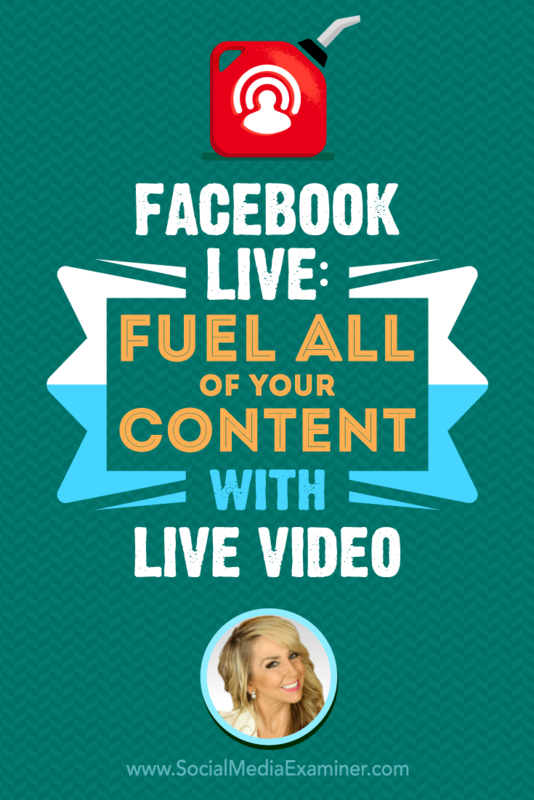 Facebook Live: Fuel All of Your Content With Live Video featuring insights from Chalene Johnson on the Social Media Marketing Podcast. While Chalene has developed a number of businesses, most people associate her with fitness and a program called Turbo Kick that she created for fitness instructors to teach in health clubs. Instructional videos were part of the program and when a cast member fell ill, Chalene was forced to be on camera. Since that time, she’s done many videos and discovered the more she relaxed, the better she could connect with her audience, whether it was for fitness or business. Chalene first broadcast live on Periscope in the summer of 2015. She remembers it well because it was also the day she was hacked. Chalene stresses there’s no correlation between the two events. You can listen to Episode 158 of this podcast for the backstory. When she got early access to Facebook Live, Chalene went live and applied what she’d learned on Periscope. Her first Live reached a half-million people within 20 minutes and she knew it was a game-changer. Chalene shared the value of Facebook Live with her audience during a Live Q&A. Listen to the show to discover Chalene’s philosophy on the importance of doing things that are scary. Chalene believes Facebook Live is like TV, meaning you can use it to spread your message, become famous, or have a reality TV show. Mike and Chalene discuss the connection between bloggers becoming paid authors, musicians on YouTube becoming paid recording artists, and the likelihood that a future show host will be discovered through Live video. 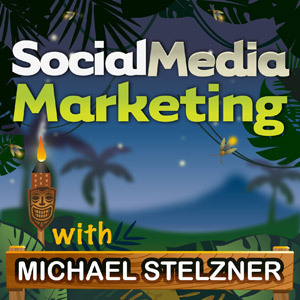 Listen to the show to hear why podcasters should consider live-streaming video. Chalene and her team have an organic plan in place for her Live videos. The calendar is set around the promotion of the Virtual Business Academy, the Marketing Impact Academy, and Smart Success. Eighty percent of the content for each Live broadcast relates to the upcoming promotion, so it attracts the people interested in the related product. Currently, she’s promoting Smart Success. Chalene is currently promoting Smart Success, so her content is designed to attract people interested in this product. Chalene aims to go live a couple of times each week. She’s noticed that the longer she broadcasts, the better the video does in terms of reach and live viewers. Often, she plans to go live for 15 minutes but ends up broadcasting for an hour. Chalene’s Live prep starts when she wakes up at 5:45 AM. She spends the first hour of her day in learning mode focusing on a certain topic. She then finds a way to relate what she’s studying to the product she’s promoting. For example, since she’s studying the neuroscience behind behavior, discipline, and habits, she’ll do a Live broadcast about developing good habits, which ties into her promotion of Smart Success. To prepare, Chalene writes down a proposed title, five bulleted discussion points, and any research or stats she wants to reference. This Live broadcast dealt with issues that relate to Chalene’s Smart Success product. She describes how to start a broadcast and in which order to share information. In the first 10 seconds, tell people what you’re talking about and why they need to stay tuned. Next, introduce yourself, say hello to a few people so they know the broadcast is live, and then go into the content. Chalene goes through the first two discussion points without much interaction, then breaks for some questions. She then finishes up the last three points and wraps the broadcast with more questions. Listen to the show to discover what equipment Chalene uses for her Live broadcasts. Typically, the promotion of Chalene’s Live video is minimal. That said, there are exceptions. 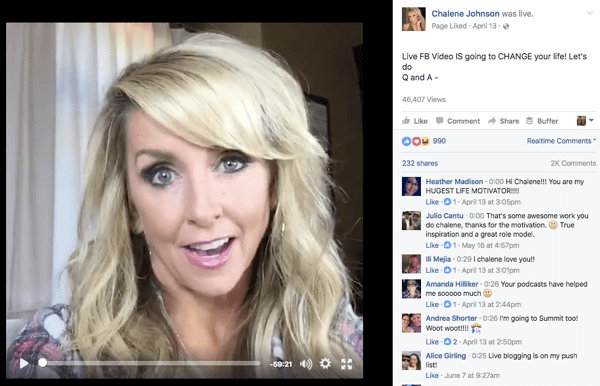 A late night Facebook Live broadcast from Chalene Johnson. Listen to the show to hear our thoughts on video thumbnails. 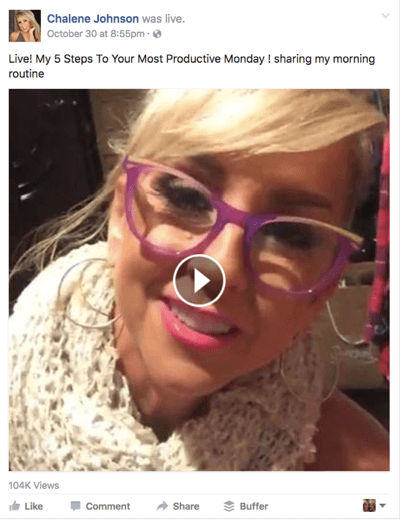 Chalene describes what she and her team do with the content from her Facebook Live videos. When she goes off the air, her Live video is automatically saved to her iCloud account. From there, she uploads it to Dropbox. Her virtual assistant then takes the video from Dropbox, strips the audio, puts a bumper at the beginning and end, edits out anything that doesn’t relate to the content, and turns it into a podcast. Chalene’s team turns her Live videos into podcasts. He then sends the original audio to another virtual assistant who turns it into a transcription. The transcription is turned into an SRT file that’s uploaded to the original Facebook Live video to give the video captions. The transcription is sent to Chalene’s writer, who creates as many blog posts as possible. When they’re published, each blog post includes a link back to the podcast. In addition, random statements, comments, and facts are pulled from the transcription and turned into hundreds of tweets, which are scheduled out over the course of the year. Her team also pulls 10- or 15-second clips of bloopers and funny pieces from the original Live video for future posts on Facebook. Finally, her virtual assistant will turn the content into an infographic, which is used for multiple Pinterest posts that point back to her blog. Listen to the show to learn why Chalene thinks investing in a team is important. Learn more about Chalene on her website. Watch Chalene on Facebook Live. Listen to the Build Your Tribe and The Chalene Show podcasts. Explore Chalene’s fitness programs such as Turbo Kick, and watch the Turbo Kick promo. Listen to Episode 158 to hear Mike’s podcast with Chalene on security. Take a look at the Virtual Business Academy, the Marketing Impact Academy, and Smart Success. Explore Chalene’s podcasts and read the transcripts. Learn about adding an SRT file to your Facebook video. Follow Chalene on Pinterest and Twitter. What do you think? What are your thoughts on Facebook Live? Please leave your comments below.